This strange looking ship arrived through the mirk this morning. JAEGER ARROW, described as a 'Totally Enclosed Combined Forestry and Liquid Pitch Carrier', was built by the Hyundai Mipo shipyard in Korea in 2001. She has five dry cargo holds, and two tanks for the carriage of pitch. Under the 'roof' of her structure, she has two overhead cranes. JAEGER ARROW is 171.4 metres long, has a deadweight of 23,529 tonnes, and her gross tonnage is 29,103 tons. 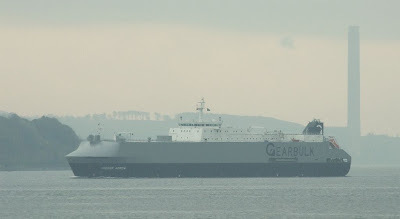 Operated by Gearbulk, a large international shipping company specialising in the carriage of forest products, she is currently employed in the carriage of woodpulp from north-eastern Canada to Europe. JAEGER ARROW was recently the subject of a blockade by Greenpeace. Very strange looking,where did she dock? She berths at Greenock Ocean Terminal each time she has visited. Her appearance is very like that of car carriers seen elsewhere, but not on the Clyde.